Dane "DC" Grant: Consider the Isle of Wight well & truly WALKED! Consider the Isle of Wight well & truly WALKED! 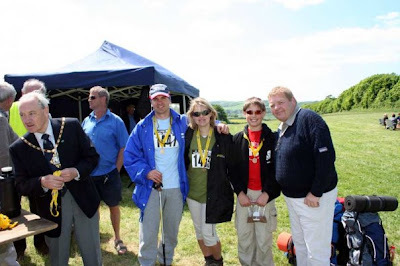 This past weekend saw the family head out to the Isle of Wight to take part in Walk the Wight '08 "An annual charity event in aid of the Earl Mountbatten Hospice on the Isle of Wight". A record 10,000 people turned up on Sunday's 13 mile and 26 mile walk, which could probably be put down to the fact that the weather was in near perfect condition. Night fell and so did the rain. In our attempt to lighten the backpacks we left behind some of the heavier items such as 10pound hammers, tons of steel tent pegs, 5 star luxury spa bath, etc etc. Which meant we ended up getting a bit wet as the wind thrashed the flimsy tent around letting water in. Needless to say we hardly got much sleep that night. The next day came and we were off. Starting our way up and down some very steep hills and through narrow walk paths stopping only now and again to catch a breath, eat snacks to refuel and at the various check-points along the route. We finished the 13miler at Carisbrook Castle, collected our medals and decided to call it a day. A quick photo finish with the Mayor (We go way back...we're practically best buddies) and then set off on our way back to the mainland. Overall the walk itself was very picturesque and something I will certainly do again ..... minus the rucksack and this time go the full 26miles!! !